An interview with Dr. Harry Edwards, adviser to athlete-activists from Muhammad Ali to Colin Kaepernick. This year has seen a remarkable renaissance of star athletes for the first time since the 1960s and 1970s using their hyperexalted platform to speak about politics. There’s only one person who can speak about these eras like no one else, one person who played a role in advising activist athletes from Muhammad Ali to Colin Kaepernick. 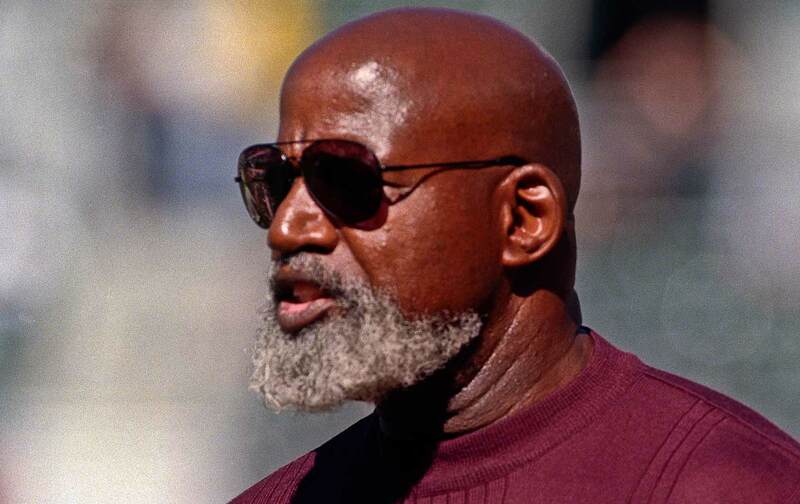 That would be legendary sports sociologist Dr. Harry Edwards. Here is an edited interview of my conversation with Dr. Edwards about the landscape for activist athletes in the age of Trump. People can listen to the interview in its entirety at the bottom of the page. DZ: What are your impressions of the election results? HE: I’m neither surprised nor chagrined at the outcome. The media, especially the mainstream media, in this country did not expose Trump because they never attacked him straight on, in terms of his racist, misogynistic, xenophobic policies. They gave him free time. Billions of dollars’ worth of free time. They didn’t expose him; they showcased him. And then, when I look at what was happening in American society, with black men, women, and children being shot down by police officers and nobody going to jail; when I looked at the way they treated the first African-American president and his family…. I never deluded myself into thinking that somehow we were in some post-racial America. Yes, a lot of people were also simply turned off by the degeneracy of the process, they didn’t see anybody that they could vote for who could make a difference. I think that’s unfortunate because I think Hillary would’ve made a difference in terms of Supreme Court appointments. The issue, now, for me, is what do we do about it? And at one level, it’s crystal clear that this situation can no longer be denied and we have to go to work. DZ: Given how, as you put it, degenerate this whole election process has been, how do you think the Trump victory is going to affect the mood, the momentum, of what we’ve seen in terms of these athlete activists? HE: I think it’s going to accelerate it, I don’t think it’s going to kill it. The media will run a whole bunch of black Uncle Tom Trump sycophants across the stage to try to explain how what he intends to do or might do is in the best interest of black people in the black community. I think that they should be dismissed out of hand. The so-called black, Christian preachers who so publicly supported Trump, these handkerchief-head Jesus pimps should be dismissed out of hand. Malcolm [X] used to call them “house Negroes.” These are not house Negroes—these are outhouse Negroes who will be run across the stage to criticize athletes, to criticize other black people and they should be dismissed. These are people who are content to live in old master’s toilet as long as they can be close to him and his money when he comes in to use the toilet. All of that is going to boil up, it’s going to be out there. But I think that athletes are going to continue to speak up and speak out. I think we’re going to get many more women athletes involved because if Trump does what he says he’s going to do, in terms of Roe v. Wade. This thing is going to ricochet throughout sports and I think that athletes will respond. I think we’re looking at an escalation in terms of athlete responses to this systematic racism and most certainly to the misogynistic racist that a majority white population has put into the White House. DZ: Now, you’ve been in several pro and NCAA locker rooms in the last week, I know. What’s the mood of the players that you’re talking to? HE: The players that I have spoken with have been trying to figure out a way to express themselves and to anticipate what they might have to deal with as protests inevitably break out in their communities as well as on their campuses. The University of Missouri set a standard of what athletes are obliged to at least to consider, if not to do. So on a number of campuses that I’ve spoken on in the last three months, athletes are trying to figure out, where does this thing fall on our campus? And suppose the students on the campus begin to organize and demonstrate around issues that impact them personally both on the campus and in the community and determine that the athletes have a role to play in that. How do we take that stand and stay unified as a team? Suppose it does come down to a threat of a boycott—are we all together? Is it a matter of democratic vote? Is it a matter of demographic vulnerability? If you’re an African American, do you have any obligation to consider what the white players on the team think? Especially in cases were so many of them were Trump supporters. All of that has been discussed. They are already considering those issues and these are difficult problems for 18-, 19-, 20-year-olds to wrestle with. They are undertaking that challenge on the campuses and most certainly in the professional sports ranks. DZ: It sounds like you’ve got an injection of hope by being around these folks. HE: Absolutely. When you have no choice, the odds and the circumstances don’t matter. It’s like taking your next breath. You have no choice. Whether you wanted to get up this morning, whether you were feeling good, bad, whether you’ve had your coffee or not, you have no choice but to take that next breath. Under these circumstances that we’re confronted with today, we have no choice. We are confronted with some possibilities that are unprecedented in American history with very, very few examples. When this man starts talking about loading up the buses and cattle cars and shipping 11 million immigrants and Latinos across the border into Mexico, we’re back to the Japanese internment camps. We’re back to the removal of Native Americans from their homelands to what, essentially, were concentration camps where they died by the hundreds of thousands. We have to begin to think about what we’re going to do. If you’ve ever wondered what you would do in 1930s Germany, I’m awfully afraid that you’re going to get a chance to find out. All of these issues are out there, not to speak of the circumstances of women, the circumstances of Muslims, is he really going to have a religious test to allow Muslims to come into this country? ISIS must be licking their chops for that to get underway. What are we going to do in order to defend America? Not to oppose him, but to defend America. Those are issues that we all now have to wrestle with out front. There’s no way to hide what is going on or what the potential outcomes could be. DZ: I’ve defended Colin Kaepernick from some of the criticism he’s received for not voting, but as someone who’s worked with Colin and is connected to the 49ers’ organization, I’d love to have your thoughts about what he’s said about this election. HE: I talk to Kaep two or three times a week, and one of the things I’ve stated is that if for no other reason, then you have so many oppositional interests who are trying to suppress the vote. You have so many people who died to secure the vote. You have so many issues down-ballot that are critically important to resolving and dealing with some of the varying injustices that you are concerned about. There’s an obligation to vote. If anybody in society knows how rigged these elections can be, it’s black people. I mean, at one point we couldn’t vote, then when we were able to vote, the districts were gerrymandered so our vote didn’t count for nearly what they should’ve counted for and now we’re dealing with voter suppression that is systematic and from the top. We know about rigged elections, but at the same time we must utilize every arrow that we have in our quiver, no matter how small or how short distance they may be geared to go. We had that conversation. He has a right not to vote, we don’t have a mandatory voting law in this country, but I think that he has to really think and sincerely consider what the impact of his not voting is, because, in this election, that was really a vote for Trump. Not only that, but what the impact of his not voting upon all of those other millennials and young people who look to him for courage, direction, guidance, insight, and so forth. DZ: In some of my darker moments, I’ve turned to Muhammad Ali, his example, what he would have said at a given moment. What does Ali have to teach us in the era of Trump? HE: I think that Ali, along with a number of other outstanding black athletes—Jackie Robinson, in his last days, who said “I never had it made and, I’m sorry, I can’t stand for either the national anthem or to say the Pledge of Allegiance”—they teach us that ultimately, it’s not the odds that are against you, it’s the magnitude of your courage and the caliber of your commitment that should guide and drive your actions and perspectives. Trump is wrong for America. Trump is wrong for the world. We have an obligation at every level to organize, to mobilize, to establish coalitions to fight this madness. The fact is that a majority of white Americans voted to put Trump in office and for him to bring in all of those other racists and sycophants and so forth that followed him down that path to the sewer. We have an obligation to mobilize and to begin to organize against the impact of that on our communities, on our colleges and universities, on our lives. That is what Ali teaches us, irrespective of the personal and individual cost. Why? Because we have no option. DZ: These are troubled times. What do you do for your mental wellness when, especially, things are this hot? HE: Well, first of all, I read. I read everything that I can get my hands on that’s going to be information. Malcolm X said that reading and studying are the activities that best reward effort. If I were talking to a person today, I would tell them to go online and read articles by two of my protégés and former students, Kareem Abdul-Jabbar and David Leonard. Read Kareem’s article What It Means to be Black During a Trump Administration and read David Leonard’s Undefeated blog, Student Athlete 2.0. I would start reading everything that I can get my hands on that informed me about developments, current and past, and how they were handled. The second thing that I would do is surround myself with people who are similarly committed. We do not have time, really, for a lot of hee-hawing or shimmy-shamming and moonwalking and hand-wringing and so forth. We have got to begin to organize because now it’s in our face. It’s undeniable, it’s the reality of America today. I have a friend that I’ve been dealing with for years. He told me ‘Oh, we’ll come out of this with some scars, but we’ll come out of it.’ Yeah, but come out of it as what? That is what the question is. So we need to go to work, but we need to inform ourselves. I’ve always been a scholar-activist because I believe that activism without scholarship is a formula for chaos and confusion, if not disaster. Scholarship without activism, doing a bunch of reading while doing nothing is empty. So read, get together with people who are similarly oriented and to begin to figure out ways where coalitions can be established, where people can be organized and mobilized to fight this madness, because that is what it’s going to come down to. It’s going to be we, the people, who are going to be the difference in what the next four years looks like.